You may recognise that handsome man above, for it’s me, your jolly old Town Crier! This fun caricature came to me courtesy of professional artist, Robin Williamson, who specialises in creating charismatic caricatures. 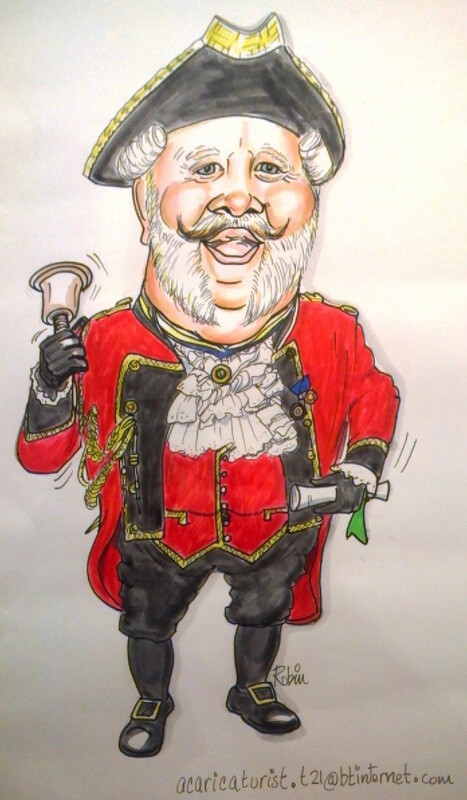 This year is a very special year for me, September 2017 will mark my 30th anniversary as a Town Crier (I know, I know, I don’t look a day over 21!) and this got me thinking about all the magnificent things I’ve been part of during my stint in the city. This, coupled with a big ol’ birthday I’ve got coming up – yes the big 6 0 is just round the corner – has made me ever so slightly nostalgic. So, why not join me on a little trip down memory lane? I landed a spot in the Guinness World Record book for my 112.8 decibel cry of that infamous line ‘Oyez, Oyez, Oyez’, I’ve been featured on Challenge Anneka – now there’s a blast from the past – I was interviewed by BBC World Service, have met celebrities including Barbara Windsor and Ken Dodd, had my face splashed over many a newspaper and even appeared on a Christmas Eve Lotto superdraw! I’m worn out just thinking about it! In more of a corporate capacity, I’ve visited Royal palaces, conference centres, and make regular appearances in both the City of London’s Stables Market and Covent Garden. I’ve been lucky enough to work with several members of the Royal Family, including the Queen, and was elected to attend the Meetings & Incentive Travel Industry Awards Gala Presentation in front of HRH, The Princess Royal. So fortunate have I been in my current posting, that I’ve also had the opportunity to work with the crowned heads of Europe, including Princess Olga of Russia and the Romanov family. Of course the Romanov’s are descendants of Tsar Nicholas, whose family were murdered by Bolshevik troops under the orders of the Ural Regional Soviet. If 2017 is the year that you want to expand your event, or you need a host with the most to liven up the proceedings, then look no further as this Town Crier can definitely be hired! For all enquiries, you can contact me directly at alanmyatt@blueyonder.co.uk or call me on 07973 472 896. With thanks to Gloucestershire Live for the image of the Queen and I.